Britain was considering the option of training a massive, 100,000-strong army in Turkey and Jordan to defeat President Bashar Assad, according to a plan drawn up by a leading British general. The invasion was later scrapped as too risky. The strategy, revealed by BBC Newsnight, involved Britain training a 100,000-strong rebel army in Jordan and Turkey over a 12-month period. The rebels would have been trained by an international coalition armed with high-quality weaponry, and would have marched on Damascus with air cover provided by Britain and its allies. The plan echoes the ‘Shock and Awe’ campaign used in Iraq during its initial invasion in 2003. 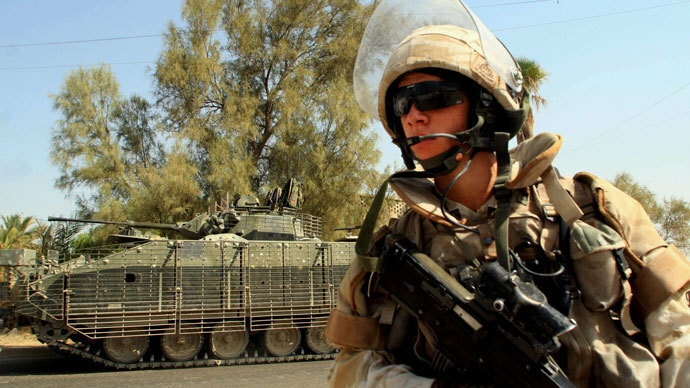 The idea was developed two years ago by Lord Richards, the UK Chief of Defense Staff at the time. During his tenure, he actively lobbied Prime Minister David Cameron to intensify the war effort in Libya, and directly target its then-leader Muammar Gaddafi, rather than just protect civilians. The UK government has refused to comment on Newsnight’s revelations. The idea was considered by Cameron and Dominic Grieve, the UK Attorney General, and sent to the National Security Council, Whitehall sources told BBC. But it was deemed too risky, they said. Further options for Britain to intervene were also scrapped, as MPs voted against military action in a parliamentary vote last year. This was not the first time the West mulled possible intervention scenarios since the Syrian civil war began in 2011. Following an alleged but unproven chemical attack by the Syrian government in Ghouta, on Aug. 21, 2013, US President Barack Obama was under pressure to send American troops to aid Syrian rebels, having publicly set out a “red line” on chemical weapons use. However, that decision was scaled back as opinion polls suggested an overwhelming number of Americans were against more military intervention overseas. The West has been significantly involved in the Syria’s war, however. Last year, reports showed that officers from the US, British and French armies were training rebel groups in Jordan, in an effort to strengthen more secular parts of Syria’s opposition. Additionally, the CIA has also assisted Syria’s rebels since the war began – providing them with intelligence to use against Bashar-al-Assad’s forces. Other reports suggest that the CIA has funneled weaponsandanti-tank missiles to the rebels through the Gulf States. With Syria becoming even more unstable, with additional threats from the rebel militia group ISIS in Iraq, Obama has requested the US Congress to approve $500 million in funding to train moderate rebel groups, in a plan similar to the one put forward by the UK’s Lord Richards. According to the latest UN estimates, around 140,000 Syrians have died since the civil war began, while more than 7 million have become refugees – a number that is expected to rise as neighboring Iraq becomes increasingly unstable.